March 2015 | It`s full of stars! To test a hybrid app for SUP 2.x or SMP 2.x on the emulator, you need to have the HWC app installed. The app is part of the SDK and delivered in source code and as a installable APK file. Creating a new emulator is easy, but how to install the app? Using Eclipse to create Android apps means that you never get in touch with the adb command line tool. The Android IDE takes care of deploying the app. You can now import the source code of the container and deploy it or take the easier alternative: install the delivered apk. Here is a step by step guide on how to install a APK using adb command line tool. Google Android documentation on adb install. This opens the cookie manager of Chrome. Deleting all cookies or a single one: it’s just a click! SAP Web Dispatcher (WD) is the entry point of your users that access your web enabled applications. These can be any HTML service or app you have running on NetWeaver, or other systems like HANA XS. For over a decade WD offers reverse proxy functionality for SAP systems, and while until shortly its main usage area was SAP Portal and Web Dynpro applications, with the rise of Fiori WD is more exposed. Naturally, more and more companies will use it. Of course WD can be integrated into SolMan and therefore can be managed and monitored. WD is the single point of entry to web applications; it contains viable information about their usage. This information can heavily influence the understanding of the app. Think about finding the bottlenecks of the app, the most accessed resources, usage patterns, and so on. The log of the web dispatcher contains all this kind of information. You only have to gather it, store it and analyze it. Basically, WD is a reverse proxy, and in the non-SAP context, Apache is one of the most used reverse proxies. Analyzing HTTP traffic is a common task for web site administrators, and so it is not a big surprise to find a huge list of Apache traffic analyze log tools available. The Swiss army knife among them is logstash. Now, logstash does not really analyze web server logs. It rather parses them and can send them to another tool for storing and analyzing the data. Like elasticsearch. To learn how to configure your own system for WD, logstash, please read the how to document I posted here. This is the default use case of logstash: Parse logs, extract the information and send it to elasticsearch for storing and retrieval. After the information is stored in elasticsearch, it can be used by Kibana for retrieving information like statistics and analytical data. Think about access statistics or trends. The vantage of the combination of logstash, elasticsearch and Kibana over a web analytic app is that you do not have to install a tracking / analyzing part in your web application. You can also analyze part of your web page normally invisible, like resources. Depending on your WD configuration, you gain insights into how WD works, like how long it takes to retrieve files from the SAP system. Number of requests: a cached resource is served locally by browser, this can decrease drastically the load on WD and backend. Average response time for CSS or JS files: does it make sense to use WD as a web cache? Think about it: the data may indicate that WD waits to retrieve a file from ICM, multiply it with the numbers of requests it takes for a user to access a resource and you have an idea of time wasted. Data send by serving static files: is your cache configuration correct? What is the largest file requested? Usages: your application is accessible only internally, does the access statistics reflect this? Hitting a lot of 304, 404 or 500? What is causing this? Monitor ICM admin resources to find out possible attack vectors. This document explains how to install and configure an environment for analyzing SAP Web Dispatcher (WD) logs with logstash, elasticsearch and Kibana under Linux. 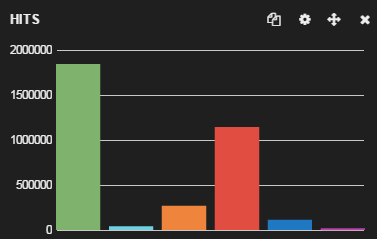 Kibana 3 needs a running web server. The example shown here is using nginx, but won’t detail how to set up nginx. Run logstsash logstash. Before logstash can be run, it must be configured. Configuration is done in a config file. The configuration of logstash depends on the log configuration of WD. Logstash comes out of the box with everything it takes to read Apache logs. In case WD is configured to write logs in Apache format, no additional configuration is needed. WD also offers the option to write additional information to the log. CLF. This is how Apache is logging. It contains most information needed. CLFMOD. Same format as CLF, but without form fields and parameters for security reason. 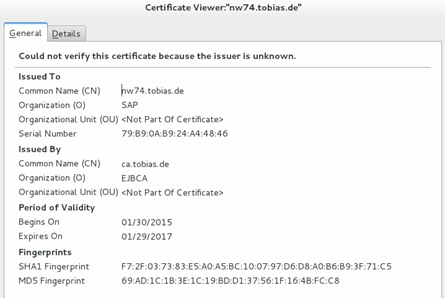 SAP: writes basic information and no client IP, but contains processing time on SAP Application Server. This is a field you really will need. SMD: For SolMan Diagnostics and same as SAP, but contains the correlation ID. You can find an example pattern file here: https://github.com/tobiashofmann/wd_logstash. The standard grok pattern file defines regular expressions for user id, IPv4/6, data, etc. All files starting with access at directory /usr/sap/webdispatcher are being read by logstash. The codec parameter ensures URLs with special characters are read correctly. To all lines read a type named wd is added. The filter is applied to all lines with type wd (see input). Grok is doing the regular expressions and to find the customized patterns for WD, the patterns_dir parameter is used. The date value is given by the timestamp. If this is not set, logstash takes the timestamp when the line is read. What you want is the timestamp of the logged access time of the HTTP request. To facilitate later analysis, the values bytes and duration are transformed to integer values. As output a local elasticsearch server is defined. The logs are written to the index wd to index type logs. This stores the log lines as a value to elasticsearch and makes it accessible for further processing. This will start logstash. It takes a few seconds for the JVM to come up and read the first log file. Afterwards the log files are parsed and send over to elastic search. 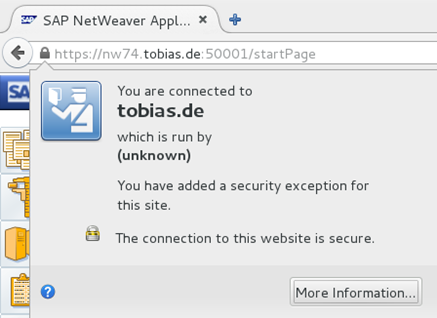 SMP 3 connects to a authentication provider using SSL. 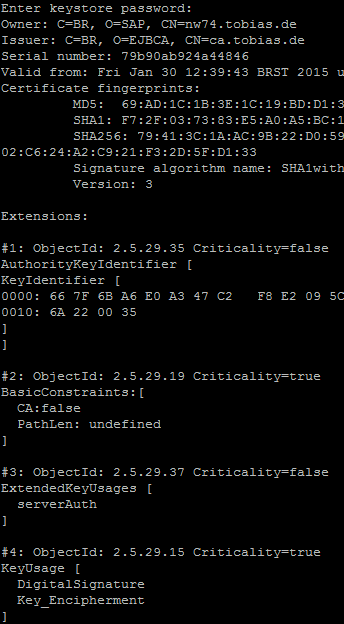 For SMP 3 to be able to connect successfully to the SSL enabled backend service, the server certificate of that backend must be installed in SMP 3. This means to install the certificate into the keystore used by SMP 3. To get the server certificate, just export it in PEM format using a browser like IE, FF or Chrome. To do so, you’ll have to open the url and then export the certificate. 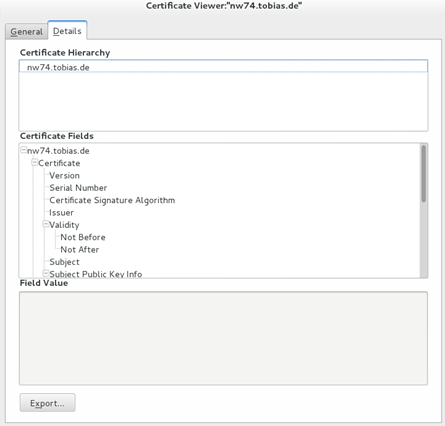 In the configuration folder of SMP the Java keystore tool will be used to add this certificate to the list of known and accepted certificates. 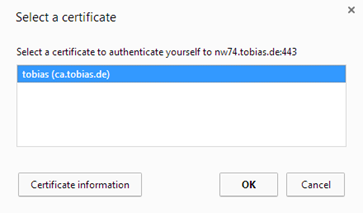 The keystore tool shows the information of the certificate and asks if you really want to import the certificate. Answer as yes and the certificate is added to the trusted list. To make sense look good, rename the file to SSLPoke.class. The above URL also explains how to use the class and how to specify the keystore to use for verifying the connection.